All artwork is available for prints, notecards and mugs. Shipping fee is $5.95 and items can be shipped directly to you or another address. If you're interested in purchasing original art, please contact Karl Melton via email. Choose from one of three sizes. 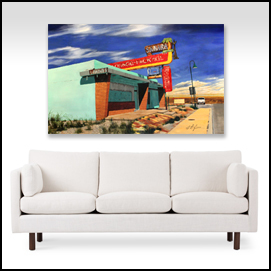 Each print is produced on ready-to-hang, stretched giclée canvas. Pack of 25 blank notecards 4.25" x 5.5". Printed on high-quality matte finish stock. Envelopes included. Have any painting reproduced on a 15-oz. coffee mug. These beautiful ceramic mugs are dishwasher and microwave safe.